Let's all move to the Isle of Wight and camp out every. Single. Night. 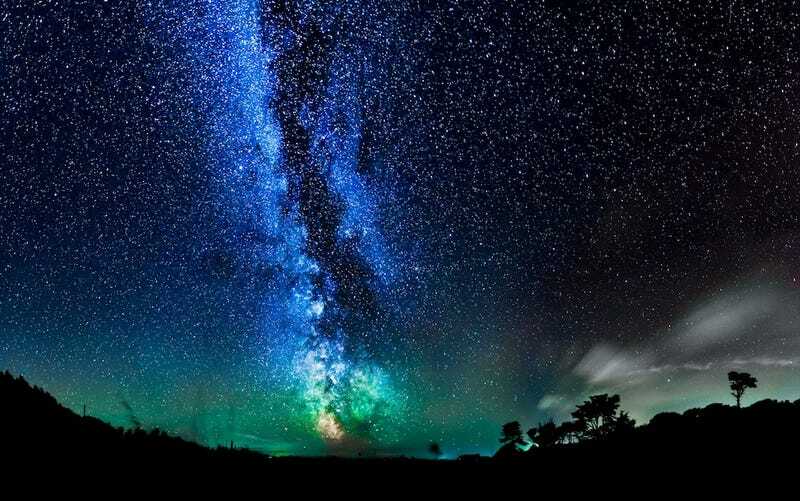 Astrophotographer Chad Powell captured this vision of the Milky Way arcing phosphorescent over England's Isle of Wight, which island is renowned for its lack of light pollution. What Do We Really Mean When We Say Light Is "Pollution"? I have lived on the Isle of Wight all my life and up until late last year, I was totally unaware of the great dark skies the Island has compared to the rest of the UK. Don't get me wrong, the Isle of Wight skies have nothing on areas of New Zealand/Australia and the US in regards to dark skies but it is definitely up there as one of the best locations in the UK for astronomy. Although I say this, it is always a constant battle with light pollution when shooting the night sky in nearly all situations, several friends who live in the US have to drive and hike for hours to get away from the city lights and into dark sky locations, luckily I only have to walk 10 minutes from my home to get in a fairly dark area, which I'm extremely fortunate for. Really stunning stuff. For more of Powell's work, check out his website and Facebook page.